It’s only mid-August. The weather is still intense at times, and our annual Labor Day Weekend in Pacific City is still a few weeks away. But for a variety of reasons, it’s starting to feel to me like the beginning of a new school year. 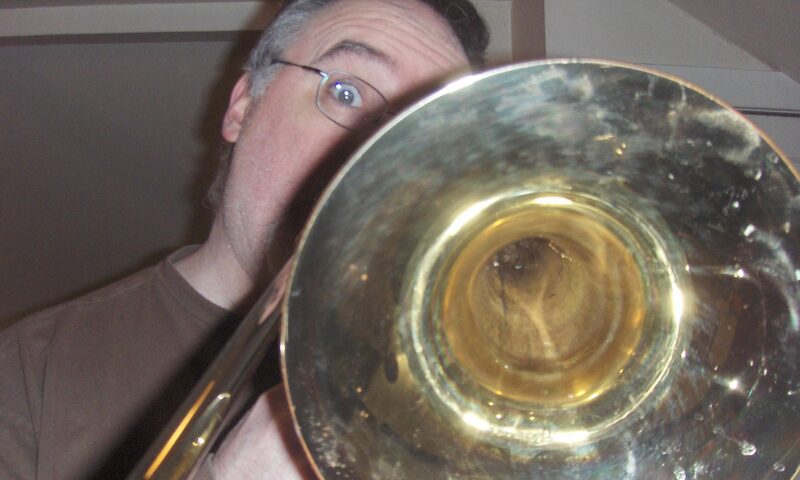 It’s a feeling I haven’t experienced in over 20 years, when my final semester of business classes, trombone lessons, orchestra concerts and jazz band rehearsals filled my schedule. The coming week has me feeling some of the same feelings I felt then – the familiar buzz of making music with old friends after a break, the excitement of a new ensemble making its debut performance, the sense of wonder that comes with an approaching lesson and the slight dread that I will not be well enough prepared for it. On Thursday August 22nd, GoBiggs Productions presents a rockin’ double bill at the Tonic Lounge. 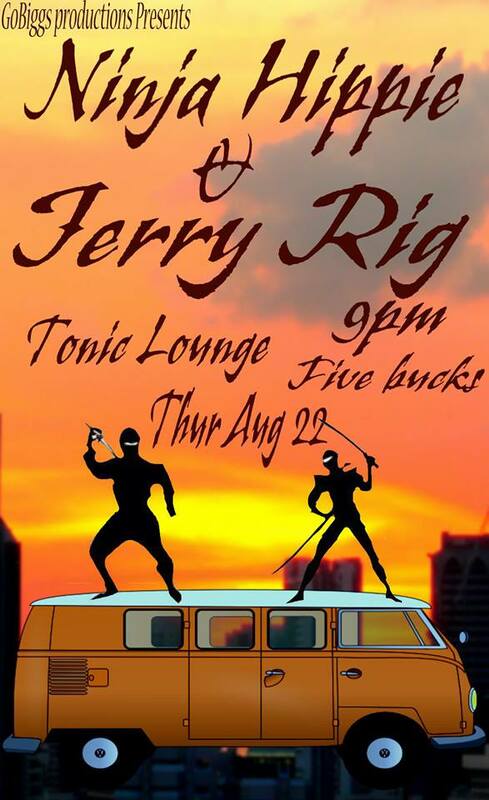 $5 gets you in the door to see two long sets of jams starting at 9pm with Jerry Rig. We’ll be playing a generous helping of tunes from our forthcoming 3rd album, as well as your old Jerry Rig favorites. Ninja Hippie follows with a long set of under-the-radar covers, classic and new, held together with tight arrangements and mind-melting improvisation. Best bang for your booty-shaking buck in town. The next night, Friday August 23rd, the Latte Da Coffeehouse and Wine Bar in Vancouver hosts a unique evening of music, as we raise the curtain on a new project while bidding adieu to a bright young star on his way out of town. The show starts early at 7pm as Miles Hewitt performs one of his final solo acoustic sets of original material before beginning his own college adventure at Harvard. He will likely be featuring songs from his incendiary new release, Empire, which will surely be affordably priced at the show. Get it now before it blows up! Shortly thereafter, proud papa Scott Hewitt and I will debut our new project, the Slope, along with our newest musical co-conspirators, guitarist Rick Kahn and bassist Keith Picone. The Slope is a blend of acoustic and electric sounds in an intimate setting. Scott and Rick bring some insightful and soulful original material to the group, as well as some imaginative arrangements of familiar favorites by Paul Simon, Elvis Costello and Stephen Stills, to name a few. This gig is particularly exciting for me as I will be debuting a new and innovative hybrid percussion kit, integrating elements of my usual hand percussion setup into a small, acoustic-friendly drum set. Scott and I have been playing together for many years, a fact that will be driven home on Saturday September 7th when we re-join Mike Smith and Matt Kuerbis for Mystic Canyon’s 10th Appearance at the Vancouver Peace & Justice Fair. We’ll be taking the Esther Short Park Bandshell stage at 2pm for our yearly tradition, but please come early to explore informative displays, worthwhile causes and a wide variety of performers the whole family will enjoy. But before all of this, my back-to-school vibe reaches its peak when I have the privilege of taking a private trombone lesson with the sensational Natalie Cressman. As a reward for contributing to the Kickstarter for her brilliant new album Turn the Sea, Natalie agreed to meet with me for a lesson prior to her performance at the Camellia Lounge. I have been playing more drums than anything else this summer, so I’m playing a little catch-up this week, but it wouldn’t be the first time I’ve “crammed” for a lesson. I am confident that I can learn a lot from this extraordinarily talented young lady, and I look forward to writing about it here. Next PostNext Where’s the Outrage?